Cosmetic Surgical Procedures are performed in Dr. Popham’s privately owned surgery center accredited by the Joint Commission and licensed by the state of Colorado. These cosmetic procedures include eyelid procedures to reduce the tired appearance of bags under the eyes and lift eyelids, as well as face and neck lifts, CO2 laser resurfacing of the skin, and liposelection and body contouring. Dr. Popham is widely regarded as a leading surgeon in the area for cosmetic procedures and has been voted Denver’s best blepharoplasty surgeon by his peers in 5280 Magazine on five occasions – more than any other oculoplastic surgeon in Denver. A surgical procedure directed toward restoration of youthfulness and reduction of the effects of aging around the eyes. Blepharoplasty involves removal, repositioning, and tightening of various structures around the eyes. Most commonly, it involves removal of excess, overhanging skin, removal of modest amounts of fat (in most patients), repositioning of fat, and tightening or re-support of muscles in the area of the eyelids. Blepharoplasty is custom designed for each patient in accordance with the patient’s particular anatomy and unique patterns of aging. Blepharoplasty is directed toward restoring a brighter appearance and rejuvenating the look of the eyelids without changing the eye or eyelid shape. Dr Popham’s goal in blepharoplasty surgery is to allow his patients to look more rested and less tired, but also to continue to look like themselves. Blepharoplasty or “eyelid tuck” surgery is a delicate and detail oriented surgery requiring the utmost in training, experience, knowledge, and skill. Blepharoplasty is the most common surgical procedure performed by Dr. Popham. As a recognized and award winning oculofacial plastic surgeon, Dr. Popham focuses the bulk of his practice on eyelid surgery such as blepharoplasty, typically performing 10 or more of these procedures in the operating room each week, along with other eyelid surgeries. Since finishing his oculoplastic surgical fellowship at Harvard Medical School, Dr. Popham has been voted Denver’s best blepharoplasty surgeon by his peers in 5280 Magazine on five occasions – more than any other oculoplastic surgeon in Denver. He has also been named as one of the Best Doctors in America on 13 occasions, including every year in the past 8 years (through 2014). He has perfected the use of the carbon dioxide laser in blepharoplasty surgery, allowing him to minimize intraoperative bleeding and thereby reduce recovery time in his busy patient population. Dr. Popham’s blepharoplasty procedures are performed in his own private surgery center accredited by the Joint Commission and licensed by the state of Colorado, using IV sedation and local anesthesia, on an outpatient basis. Dr. Popham has taught many doctors in training the art of blepharoplasty surgery. He has also co-authored the book used to teach blepharoplasty surgery to residents in training worldwide, “Orbit, Eyelids, and Lacrimal System,” published by the American Academy of Ophthalmology. Over time, the effects of gravity, sun exposure, dry air, and general stress takes its toll on an individual’s face and neckline. Jowls can develop along the jawline with folds and fat deposits or fat loss. Sometimes creases begin to form between the nose and the mouth, as well as on the cheeks and neck. A facelift can considerably reduce these signs of aging by re-draping the skin around the face and neck, repositioning the facial fat pads, and tightening the underlying facial muscles in a layer called the SMAS (superficial musculo-aponeurotic system). Modern face lifting surgery is more than skin tightening offered in factory styled centers under local anesthesia in a brief amount of time. Excellence in face lifting takes time in the operating room, requires general anesthesia or heavy intravenous sedation, and involves lifting and repositioning of the under structures of the face. These techniques offer the patient the most natural, rejuvenated postoperative appearance, and offers long lasting effects. Facelift surgery or neck lift surgery may be performed independently or together. Face and neck lifting surgery may also be performed in conjunction with other surgical procedures such as blepharoplasty or eyelid lift surgery, endoscopic brow lifting, or laser resurfacing of the skin. In most cases, facelift surgery (rhytidectomy) can reduce the outward signs of aging by ten to fifteen years. Carbon dioxide laser resurfacing is the most effective means of facial laser skin rejuvenation. It reduces fine lines, pigment spots, acne scars, and sun damage while giving the facial skin a renewed smoothness and glow. 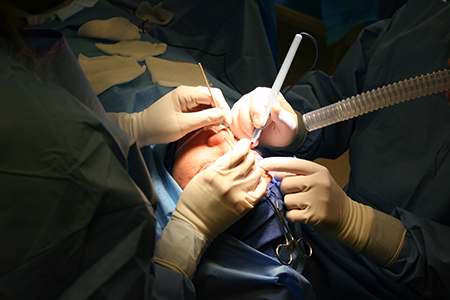 This procedure is applied through the use of a computerized pattern generator (CPG), allowing Dr. Popham to place a fine and accurate computer generated network of laser spots over the treated facial skin. The experienced and professional staff of Park Avenue OculoPlastic Surgeons will educate each patient on preparation for CO2 laser resurfacing and on aftercare following CO2 laser resurfacing. VASER LipoSelection is a modern, cutting edge technology applied to body contouring or re-shaping. The VASER LipoSelection procedure involves tissue selective ultrasonic energy. The ultrasonic energy is applied to the unwanted fat through a tiny probe inserted through a 3 mm opening in the skin. The VASER Ultrasound probe passes gently through the fat pad and liquifies the fat while leaving other important tissues, such as blood vessels, largely undisturbed. The emulsification or liquidation of the fat then allows gentler and kinder removal of the fat, with less postoperative pain and more smoothness than standard, cutting liposuction techniques. VASER liposelection is commonly used to reduce the fat pad under the chin or in the neck. It is also commonly used to flatten and sculpt the abdomen, the flanks or “love handles, the lateral thighs or “saddle bags”, and the arms or inner thighs.